We associate the word “Valentine” with pink hearts and passionate love, but its Latin root, “valens,” actually means strength. We also imagine that Valentine’s Day originated from Saint Valentine, a third-century priest who coincidentally died on Feb. 14, but it actually stems from an even more ancient Roman fertility feast. Saint Valentine did exist and was not just the patron of love but also the patron of beekeeping, fainting, plague and epilepsy. However, the holiday that we see so iconically loving now has always been swathed in red: blood from sacrificed goats and dogs, blood from the “ceremonial” whipping of women to increase fertility and the blood from the decapitated heads of martyred saints. Lupercalia: the ancient, Roman version of Valentine’s Day. The fertility feast was also celebrated around Feb. 14; however, everyone would be drunk and naked (perhaps the unlinked connection to the past and present of Valentine’s Day). Rather than the cliche candy hearts and red roses, men showed their love by whipping women with the hide of slain animals. Usually a goat would be sacrificed, and then their skin would be dipped in blood before it was used. Women would line up in droves to get beaten, thinking that a hunk of blood-soaked goatskin would make them more fertile. In addition, couples sexed it up in a whole different way: The names of single ladies would be placed into an urn, and bachelors would draw out their “lucky” girl. Lucky, of course, meaning spending the next year copulating with each other. Apparently, Lupercalia was so romantic that France and England were struck with the same idea during the Middle Ages. Not the women-beating part, just the drawing a name out of the hat (thank God). The men erred on the charming side and would draw a heart on his sleeve, indicating his commitment to a particular love interest for the year. This is a possibility of where the notion of “wearing your heart on your sleeve” came from. However, if a man was displeased with a woman’s dancing and cooking skill and left her, she would isolate herself for a week before banding together with all the other spurned women to burn the drawn names (the women were then called “Valentines”). The ancient Roman’s Lupercalia feast gave us the holiday’s theme of fertility — in which we romanticized into love, but they could have also been responsible for the naming. 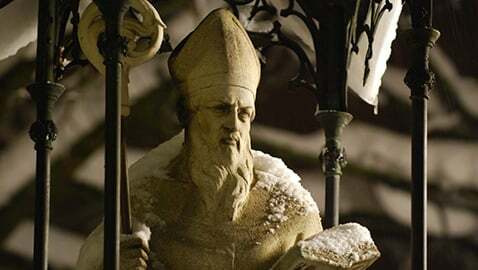 Saint Valentine’s perceived influence on the holiday is actually very vague, especially since there have been at least three figures identified with this name. In addition, there are many different stories and legends on how these fabled men have come to influence the holiday. Other than nomenclature and ordained sainthood, the only thing these men shared was their violent ends. Medieval miracle plays would depict Bishop Valentine of Terni brutally beaten, blood-splattered and then decapitated before angels took him away. That sounds like love. Saint Valentine, who lived during Emperor Claudius II’s reign in Rome, is the one we allegedly name the holiday after. Valentine was a third-century, Christian priest who married people despite Claudius’ ban on marriage (the ban being enacted so that men were not distracted with distant lovers during military campaigns). He was beaten with clubs and stones, and finally decapitated, on Feb. 14 for allegedly aiding Christians in Rome. But it was before his death that he had written a letter to the jailer’s daughter, whom he befriended and possibly loved. The letter was signed “from your Valentine,” thus writing the first Valentine card in history. When Hallmark caught wind of creating Valentine’s Day cards in 1913, the holiday would never be the same with industrial-level production of the iconic cards. If you have a significant other on Valentine’s Day, think about how love has conquered all; no more beating women and beheading saints — only the overdone Hallmark cards and chocolates and roses. If you are single, consider yourself saved from this bloody holiday and its turbulent history. If you side on one side or the other, or just ambivalent to it all, Valentine’s day is just around the corner and on a three day weekend. Maybe it is just a little special.